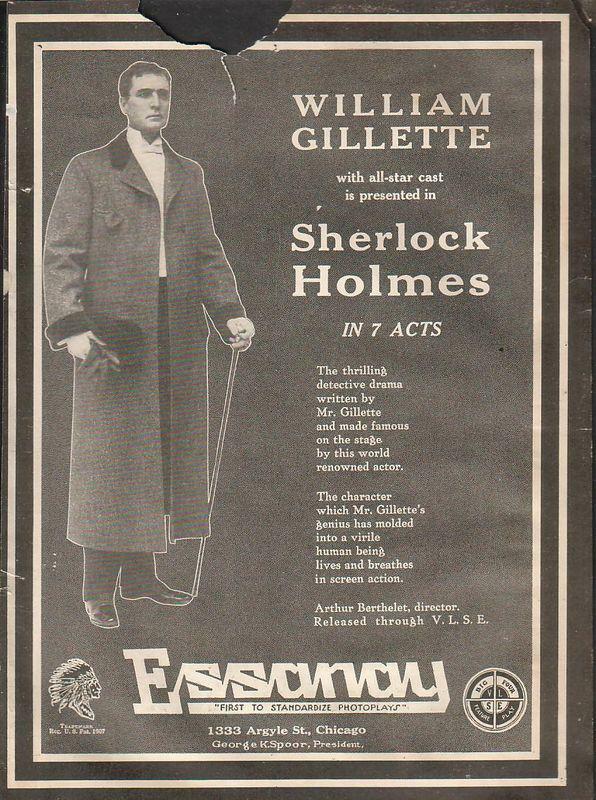 By 1916 William Gillette had played Sherlock Holmes hundreds of times. On the stage, Gillette was known for his impeccable timing, attention to detail and “first time” method of acting. How interesting it must have been in 1916 for him to now have to try and portray the Great Detective without words. The silent film version of Gillette’s play Sherlock Holmes was produced by Essanay Studios at the Iverson Ranch in California. The Iverson ranch would become the backdrop for over 2000 movies in the next century. 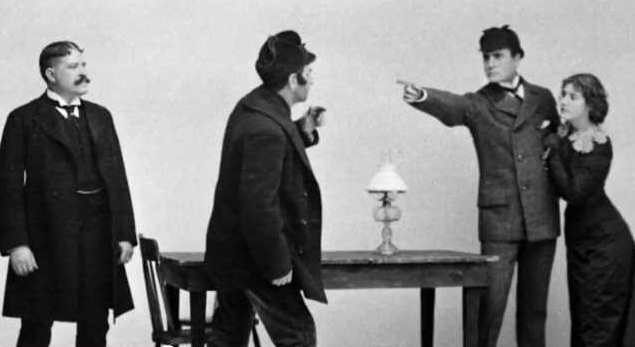 The play is well known to all Holmes fans and is a compilation of at least four stories: The Final Problem, A Scandal in Bohemia, A Study in Scarlet and The Copper Beeches. Gillette would play the part over 1300 times in his career. In the movie, Holmes has been hired by a friend of a nobleman to recover some letters from Alice Faulkner. The problem is that Alice is the prisoner of a couple that work for, who else but Prof. Moriarty. Watson does not have an overly large part in the play but his character is important. Unfortunately the original 1916 film is lost to history. The film would be remade in 1922 staring John Barrymore. There is also a good adaptation starring Frank Langella on you tube, though it is broken up into scenes and acts. http://www.youtube.com/watch?v=-w-r-pWGCeo&feature=related is where one should start. Sherlock Holmes starred Gillette as Holmes, Marjorie Kay as Alice Faulkner, Ernest Maupain as Moriarty, and Edward Fielding as Watson. The press releases say almost nothing about anyone except Gillette. Neither do the reviews. Kay gets some notice as does Maupain but Fielding is about left out. I wish there were some in depth reviews with attention to our Watson but I haven’t found them so far. However, I cannot imagine Gillette using anyone but a very distinguished actor for his Watson. And Fielding was a distinguished actor. Fielding was born 19 March 1875 in Brooklyn, New York (back when Brooklyn was still an independent city). But Fielding made his stage debut in London . He really remained a stage actor and did only five movies during the silent era. Sherlock Holmes was his first film. He would complete the other four in 1916. With the coming of talkies everything would change for Fielding. From 1930 until his death 10 January 1945 he would be in constant demand in the film industry. 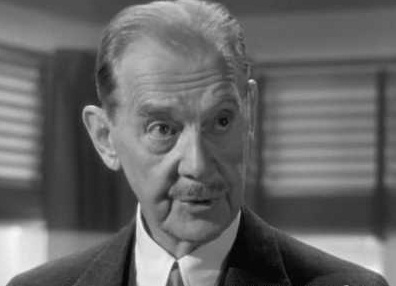 In 15 years he would appear in 79 movies, many of which would become classics: The Pride of the Yankees, Rebecca, Kitty Foyle, See Here Private Hargrove, Random Harvest and Ten Gentlemen From West Point just to name a few. In the theater he would play the leading man for ladies like Ethel Barrymore, Laura Hope Crews and Gracie George. He was a much sought after actor. In 1913 he married Metropolitan Opera star Elizabeth Sherman Clarke and they had one child. Fielding died of a heart attack while mowing his lawn in Beverly Hills. Elizabeth died in 1959. This entry was posted in Doyle, Holmes, Watson and tagged Edward Fielding, Gillette, Holmes, Watson. Bookmark the permalink.